In a lot of other areas I thought they were right-on. 21 guys from UMD....18 from Kato. Come on.. These lists are a bit....too inclusive. 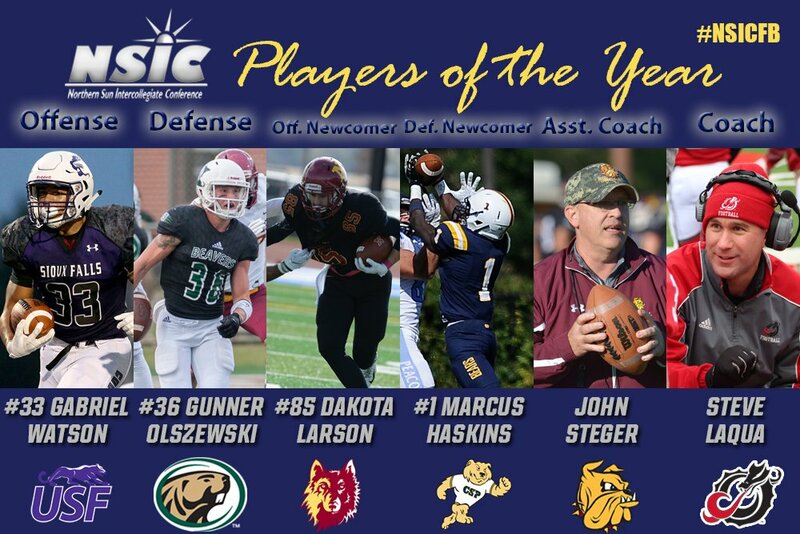 Since when has NSIC awarded an Assistant Coach of the Year award? Congratulations to Coach Laqua! Well deserved! You and Tom Frederick both. I do know my QB would be Blake Gimbel tho..and I don't need to even think about that one. I would even take Saddler over Lammers. Better numbers and more wins, granted upper Iowa is a much lesser talented team. Lammers over Gimbel is an absolute joke. Do coaches even pay attention? The stats aren't even close either. I would have had Lammers HM behind Sadler as well. 8th in sacks at 7.5. Other than Gimbel and Ratkovich getting ripped off by clueless coaches, I have no complaints on SMSU - we got about as many total sports as deserved. Abd the players recognized were the right ones. As I said a week ago or so we had 3 first team guys - Davis, Gimbel, and Ratkovitch -- all all were easy calls. I also correctly predicted 2 second team guys in Hollowell and Ney. I'm nominating MSU's chain gang crew for first team all conference. The fact that Dewey Marble bribed me to do so has nothing to do with it. 70	Parker Blakeslee	OL	Sr.	Bemidji State	Claremont, Calif.
12	Landon Jones	WR	Sr.	Bemidji State Auburn, Wash.
33	Andrew Lackowski	RB	Sr.	Bemidji State	El Dorado Hills, Calif.
69	Nicholas Niemi	OL	Jr.	Bemidji State	Cloquet, Minn.
67	Jason Anderson	OL	Sr.	Minnesota Duluth	Brooklyn Park, Minn.
66	Matt Juneau	OL	Sr.	Minnesota Duluth	Brooklyn Park, Minn.
9	John Larson	QB	So. Minnesota Duluth	Braham, Minn.
69	Trapper Ward	OL	Sr.	Minnesota Duluth	Rice Lake, Wis.
10	Jake Richter	WR	So. MSU Moorhead	Detroit Lakes, Minn.
3	Gregory Lewis	RB	Sr.	St. Cloud State	Milwaukee, Wis.
9	John Solberg	WR	Jr.	St. Cloud State	Cambridge, Minn.
9	Gabe Ames	LB	So. Bemidji State	Rosemount, Minn.
75	Joshua Wleh	DL	So. Bemidji State	Brooklyn Park, Minn.
50	Alex Helmer	LB	Sr.	Minnesota Duluth	Prescott, Wis.
24	Tareq Abulebbeh	DB	Sr.	Minnesota Duluth	San Diego, Calif.
98	Dre Greer	DL	Sr.	Minnesota Duluth	Dolton, Ill.
11	Sam Lynch	DB	Sr.	Minnesota Duluth	Plymouth, Minn.
51	Nate Pearson	LB	So. Minnesota Duluth	Lake Nebagamon, Wis.
52	Darius Woods-Steichen	DL	So. MSU Moorhead	Mahnomen, Minn.
13	Kiante Goudeau	DB	Sr.	Minot State	Huntington Beach, Calif.
47	Noah MacPherson	LB	Sr.	Northern State	Menahga, Minn.
66	Jake Schley	DL	Sr.	St. Cloud State	Cudahy, Wis.
4	JoseLuis Moreno	P	Jr.	Minot State	San Lorenzo, Calif.
4	JoseLuis Moreno	K	Jr.	Minot State	San Lorenzo, Calif.
75	Jake Lacina	OL	Jr.	Augustana	St. Paul, Minn.
9	Nickel Meyers	WR	Jr	Augustana	Sioux Falls, S.D. 23	Nate Gunn	RB	Jr.	Minnesota State	Minooka, Ill.
69	Evan Heim	OL	Jr.	Minnesota State DePere, Wis.
70	Hunter Toppel	OL	So. Minnesota State DeForest, Wis.
84	Shane Zylstra	WR	Jr.	Minnesota State	Spicer, Minn.
16	Clint Sigg	TE	Jr.	Sioux Falls	Longmont, Colo.
33	Gabriel Watson	RB	Jr.	Sioux Falls	Piedmont, Calif.
78	Trey Pipkins	OL	Sr.	Sioux Falls	Apple Valley, Minn.
3	Daniel Davis	WR Jr.	SMSU	Tarpon Springs, Fla.
73	Carter Berlin	OL	So. Winona State	Augusta, Wis.
30	Kirby Hora	LB	Sr.	Augustana	Sioux Falls, S.D. 55	Joey Newman	DL	Sr.	Augustana	Crooks, S.D. 52	Chris Garrett	DL	So. Concordia-St. Paul	Milwaukee, Wis.
1	Marcus Haskins	DB	Fr. Concordia-St. Paul	Cottage Grove, Minn.
4	Ty’Shonan Brooks	DB	So. Minnesota State Brooklyn Park, Minn.
90	Zach Dodge	DL	Sr.	Minnesota State Salem, Wis.
49	Alex Goettl	LB	Jr.	Minnesota State	North Mankato, Minn.
54	Jayme LaPlante	DL	Sr.	Minnesota State Chatfield, Minn.
32	Hakeem Johnson	DB	So. Sioux Falls	Remington, Va.
55	Tyler Thomsen	LB	Jr.	Wayne State	Fremont, Neb. 4	Isaiah Hall	DB	So. Winona State	Burnsville, Minn.
15	Casey Bednarski	P	Sr.	Minnesota State	Oconomowoc, Wis.
4	Isaiah Hall	RS	So. Winona State	Burnsville, Minn.
72	Hank Bellefy	OL	So. Bemidji State	Bemidji, Minn.
61	Noah LeBlanc	OL	So. Minnesota Duluth Hayward, Wis.
5	Nate Ricci	WR	Sr.	Minnesota Duluth	Stillwater, Minn.
26	Wade Sullivan	RB	Fr. Minnesota Duluth Lakeville, Minn.
74	Joe Yernatich	OL	Sr.	Minnesota Duluth Duluth, Minn.
64	Nathan Belisle	OL	Jr.	MSU Moorhead	Athens, Wis.
3	Grady Bresnahan	WR	So. MSU Moorhead	Casselton, N.D.
66	Andrew Erickson	OL	Sr.	MSU Moorhead	St. Croix Falls, Wis.
9	Zach Simons	RB	So. MSU Moorhead	Neenah, Wis.
4	Hunter Trautman	QB So. Northern State	St. Francis, Minn.
85	Dakota Larson	WR	Fr. Northern State	Spring Creek, Nev.
81	Jacob Streit	TE	Fr. Northern State	Watkins, Minn.
99	Alex Hoffman	DL	Jr.	Bemidji State	Lakeville, Minn.
4	John Vogeler	DB	Sr.	Bemidji State	Alexandria, Minn.
3	Bill Atkins	DB	Jr.	Minnesota Duluth	Minnetonka, Minn.
49	Isaac Erdmann	LB	Jr.	Minnesota Duluth Menasha, Wis.
94	Tom Johnson	DL	Jr.	Minnesota Duluth Freedom, Wis.
27	Michael Kirkendoll	DB	So. Minnesota Duluth Milwaukee, Wis.
44	Gus Wedig	LB	Sr.	Minnesota Duluth Walworth, Wis.
21	Aaron Doan	DB	Sr.	MSU Moorhead	Bismarck, N.D.
14	Michael Strand	LB	Sr.	MSU Moorhead	Barnesville, Minn.
55	Jack Horter	LB	Sr.	St. Cloud State	Sussex, Wis.
97	Ferris Ingraham	DL	Jr.	St. Cloud State	Evanston, Ill.
72	Skyler Kurt	DL	Jr.	St. Cloud State	Lodi, Wis.
28	Isaac Aanerud	K	Sr.	Bemidji State	Otsego, Minn.
16	Jacob Wiedrich	P	Sr.	Northern State	Moorhead, Minn.
84	Chet Peerenboom	TE	Sr.	Augustana	Little Chute, Wis.
74	Cody Rofshus	OL	Sr.	Augustana	Luverne, Minn.
28	Rudolh Sinflorant	RB	So. Augustana Dunnellon, Fla.
70	Rich Kelly	OL	Jr.	Concordia-St. Paul Plainfield, Ill.
66	Jared Gossen	OL	Fr. Minnesota State	De Pere, Wis.
74	Nolan Kern	OL	Jr.	Sioux Falls	Eau Claire, Wis.
30	Colton Myles	RB	Jr.	Sioux Falls	Richfield, Minn.
69	Adam Sheffield	OL	Sr.	Sioux Falls	San Jose, Calif.
11	Nate Rogers	WR	Sr.	Wayne State	South Sioux City, Neb. 10	Isaiah Frandsen	WR	Sr.	Winona State	Barron, Wis.
5	Avram Tynes	DB	Sr.	Augustana	Omaha, Neb. 98	Chance Bowen	DL	So. Minnesota State	New Hope, Minn.
20	Cole Schroedermeier	DB	So. Minnesota State	Sioux Falls, S.D. 96	Steven McKee	DL	Sr.	Sioux Falls	Yankton, S.D. 10	Brody Grantham	LB	Jr.	Sioux Falls	Hayti, S.D. 4	Cory Hollowell	DB	Jr.	SMSU	Corona, Calif.
5	Alex Ney	LB	Sr.	SMSU	Rochester, Minn.
6	Michael Ferrante	DL	Sr.	Winona State	Roselle, Ill.
30	Romario Gayle	DB	Jr.	Winona State	Niles, Ill.
1	Devon Moore	LB	So. Winona State	Chicago, Ill.
15	Casey Bednarski	K	Sr.	Minnesota State	Oconomowoc, Wis.
85	Nate Johnson	RS	Jr.	Sioux Falls	Vista, Calif.
35	Grant Bushinski	LB	Jr.	Bemidji State	Cornelius, N.C.
50	Dylan Ellingson	DL	Sr.	Bemidji State	Anoka, Minn.
48	Matt Gross	FB	Jr.	Bemidji State	Napoleon, N.D.
20	Michael Junker	DB	Jr.	Bemidji State	Hastings, Minn.
8	Mannie Kugmeh	WR	So. Bemidji State	Hopkins, Minn.
41	Grady Blewett	LB	Jr.	UMary	Bozeman, Mont. 88	Luke Little	WR	So. UMary	Bismarck, N.D.
25	Will Cole	DB	Sr.	Minnesota Crookston	Compton, Calif.
7	Ali Alkhatib	LB	Sr.	Minnesota Crookston	Rosemount, Minn.
81	Tyler Lattery	TE	Sr.	Minnesota Duluth	Lakeville, Minn.
33	Zach Ojile	TE	Fr. Minnesota Duluth Blaine, Minn.
93	Emmanuel Tetteh-Jada	DL	So. Minnesota Duluth Rochester, Minn.
44	Matthew Domek	DL	Jr.	MSU Moorhead	Addison, Ill.
8	Deiondre Taylor	DB	Jr.	MSU Moorhead	Crest Hill, Ill.
14	Lavante Bushnell	WR	Jr.	Minot State	Stockton, Calif.
34	Kywan Owens	DB	Sr.	Minot State	Carson, Calif.
83	Lane Torgerson	WR	Jr.	Minot State	Colstrip, Mont. 52	Jordan Will	DL	So. Minot State	Minot, N.D.
61	Drew Fahrman	OL Jr.	Northern State	Fargo, N.D.
41	Alex Gray	DB	Sr.	Northern State	Pierre, S.D. 87	Anthony Carver	TE	Jr.	St. Cloud State	Milwaukee, Wis.
2	Dwayne Lawhorn	QB	Jr.	St. Cloud State	Germantown, Wis.
14	Jamari Manuel	DB	Sr.	St. Cloud State	Madison, Wis.
73	Robert Kraklow	OL	Jr.	St. Cloud State	Mukwonago, Wis.
46	Adam Stage	K	So. St. Cloud State	Appleton, Wis.
59	Logan Swanson	DL	So. Augustana Mankato, Minn.
47	Kyle Theis	LB	Jr.	Augustana	Germantown, Wis.
22	Lajuan Preston	RB	So. Concordia-St. Paul	Fort Myers, Fla.
6	MJ Williams	WR	Jr.	Concordia-St. Paul	Orange, Calif.
27	Justin Arnold	WR	Jr.	Minnesota State	Chaska, Minn.
88	Trevor Nissen	TE	Sr.	Minnesota State	Olivia, Minn.
5	Ryan Schlichte	QB	Jr.	Minnesota State	Mankato, Minn.
7	JD Ekowa	QB	So. Minnesota State	Plainfield, Ill.
42	Jordan Bergren	DL	Jr.	Minnesota State	Elgin, Ill.
31	Harvey (Michael) Enalls LB So. Sioux Falls	Sioux Falls, S.D. 36	Tucker Stout	DB Jr.	Sioux Falls	Spokane, Wash.
63	Nick Zimmerman	OL	Sr.	Sioux Falls	Rosendale, Wis.
46	Shane Ratkovich	LB	Sr.	SMSU	Crete, Ill.
65	Zach Stratmoen	OL	Jr.	SMSU	Dawson, Minn.
24	Ian Ailts	DB	Jr.	Wayne State	Sioux Falls, S.D. 86	Conner Paxton	TE	So. Wayne State	Stuart, Neb. 95	Cole LaLiberty	DL	So. Winona State	Chetek, Wis.
23	Sam Santiago-Lloyd	RB	So. Winona State	West Bend, Wis.
Did I get all-conference too? I'm all for recognizing good performance/excellence, but as Matt mentioned, trying to be too inclusive gets ludicrous. Looking at statistics I agree with you. Olszewski numbers 36 tackles, 0 sacks. As I look at the QB stats overall for this season, it seems like they are a little down overall in comparison to what we've seen in the conference in the past few years. Have the last 4/5 years been abnormally successful for some of the QBs we have seen or is it a bit of a down group this season? I look at almost every team from 2014-2017 range that had studs playing QB. "All-timers" for their respective schools. Seems like almost any of those guys I listed above would have been, statistically speaking, 1st team All-Conference guys on their respective sides this year, but while they were all playing some were lucky to get HM because of the stacked QBs in the league at the time. Just an observation looking back on the past 5 years in the league. We all know the All Conference Message board.